HOME OF THE 2018 & 2017 SUPERBOWL CHAMPIONS!! PAYMENT PLANS NOW BEING ACCEPTED! MINIMUM $50 DEPOSIT REQUIRED ON ALL PAYMENT PLANS. PAYMENTS CAN BE MADE AT ALL SIGN UP LOCATIONS ON SIGN UP DATES. ALL REGISTRATION FEES FOR MUST BE PAID IN FULL BY SUNDAY, JUNE 30TH TO SECURE YOUR PLAYER A POSITION ON A TEAM. ALL DEPOSITS WILL HAVE A $50.00 NON-REFUNDABLE PROCESSING FEE. 2ND ANNUAL LADY PANTHERS MOTHER'S DAY BOWL! SAVE THE DATE! WEDNESDAY, MAY 8TH! OUR 2ND ANNUAL LADY PANTHERS MOTHERS DAY BOWL WILL BE HELD ON WEDNESDAY, MAY 8TH AT 6:00PM AT PATRIOT PARK. IF YOU ARE A PANTHER MOM OR ADULT FEMALE RELATIVE INTERESTED IN PARTICIPATING IN OUR 2019 MOTHER’S DAY FLAG FOOTBALL BOWL GAME, PLEASE COME OUT TO OUR HOME FIELD (PATRIOT PARK) ON THURSDAY, APRIL 11TH AT 6:30PM TO A MEETING THAT COVERS DETAILS OF THE MOTHER’S DAY BOWL. THE COST OF PARTICIPATING IN THE BOWL WILL BE DISCUSSED AT THIS MEETING ON APRIL 11TH ALONG WITH ADDITIONAL DETAILS FOR TEAM PRACTICES. WE ARE NOW ACCEPTING APPLICATIONS FOR HEAD COACHES FOR THE UPCOMING 2019 SEASON. WE ARE ACCEPTING APPLICATIONS FOR THE JR. PEE WEE DIVISION 2 (AGES 10 TO 12). IF YOU ARE INTERESTED IN COACHING, PLEASE COMPLETE THE COACHING APPLICATION HERE ON OUR SITE. THERE IS A COACHES INTERVIEW THAT WE WILL SCHEDULE WITH ALL APPLICANTS ONCE INTERVIEWS BEGIN. WE ARE NOW ACCEPTING APPLICATIONS FOR CHEER COACHES & CHEER TRAINERS FOR THE UPCOMING 2019 SEASON. IF YOU ARE INTERESTED IN COACHING OR TRAINING, PLEASE COMPLETE THE COACHING APPLICATION HERE ON OUR SITE. THERE IS A COACHES INTERVIEW THAT WE WILL SCHEDULE WITH ALL APPLICANTS ONCE INTERVIEWS BEGIN. IF INTERESTED IN VOLUNTEERING FOR ANY OF THE BOARD POSITIONS, PLEASE COMPLETE A BOARD MEMBER APPLICATION LOCATED HERE ON OUR WEBSITE AND WE WILL CONTACT YOU TO SCHEDULE A INTERVIEW WITH OUR BOARD. WE ARE VERY HAPPY TO HAVE ALL COACHES JOIN OUR 2019 COACHING STAFF AND LOOK FORWARD TO A GREAT SEASON. WE ARE INTERVIEWING FOR THE HEAD COACHES FOR THE REST OF THE DIVISIONS SO CHECK OUR WEBSITE OFTEN FOR UPDATES! WE ARE PROUD TO ANNOUNCE THAT THE JR. PEE WEE D1A TEAM HAS WON THE 2018 SCJAAF CHAMPIONSHIP IN THE JR. PEE WEE D1A DIVISION!!! 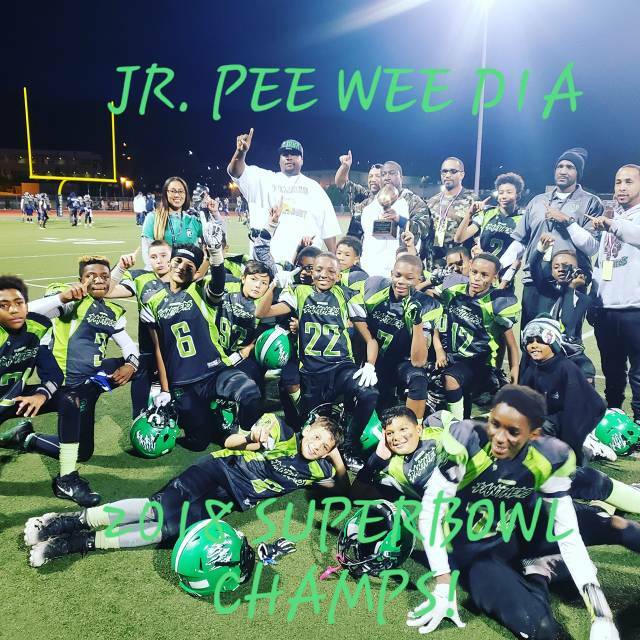 CONGRATULATIONS TO THE ENTIRE JR. PEE WEE D1A TEAMS PLAYERS, STAFF AND PROUD PARENTS ON THEIR UNDEFEATED SEASON!!! UNFORTUNATELY OUR MICRO 1A TEAM WAS DEFEATED BY THE YUCAIPA T-BIRDS IN THE 2018 CHAMPIONSHIP GAME. WE ARE VERY PROUD OF OUR MICRO 1A TEAM FOR THE GREAT SEASON WITH A RECORD OF 9-2 AND WINNER OF THE EAST DIVISION CONFERENCE. THANK YOU TO THE ENTIRE TEAMS PLAYERS, STAFF AND PARENTS FOR ALL OF YOUR EFFORTS AND SUPPORT THIS SEASON!! WE ALSO THANK OUR CHEER TEAM COACHES & OUR CHEER COORDINATORS FOR ALL OF THEIR HARD WORK AND DEDICATION TO OUR ENTIRE CHEER TEAM. WE GREATLY APPRECIATE YOU ALL! A BIG THANK YOU TO ALL OF THE PANTHER FAMILY THAT ATTENED THE COMPETITION TO CHEER OUR LADY PANTHERS ON! 2018 SEASON KICKOFF PICNIC WAS A SUCCESS! PARENTS, FAMILY MEMBERS, COACHES AND BOARD MEMBERS THAT ATTENDED OUR 2018 SEASON KICKOFF FOR COMING OUT TO JOIN US IN A GREAT DAY OF FUN, FOOD & GAMES. OUR 2018 SEASON KICKOFF WAS A GREAT SUCCESS AND WE LOOK FORWARD TO MORE UPCOMING FAMILY EVENTS THIS 2018 SEASON. 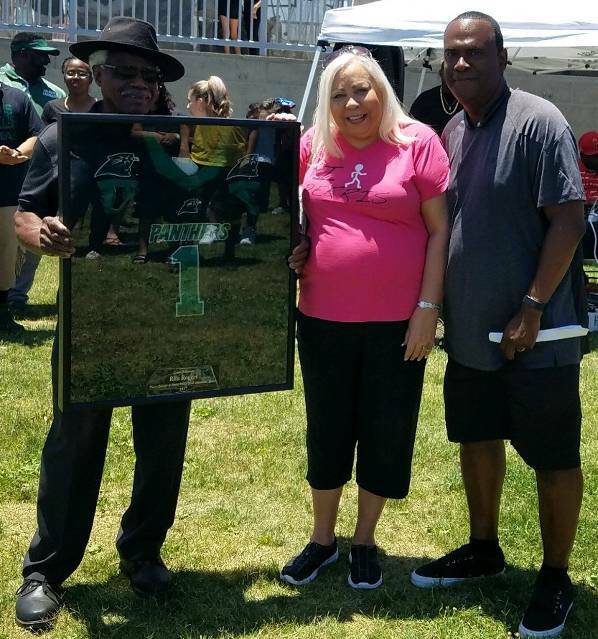 WE WOULD LIKE TO GIVE A SPECIAL THANKS TO THE CITY OF PERRIS COUNCIL MEMBER RITA ROGERS FOR ATTENDING THE PERRIS PANTHERS 2018 SEASON KICKOFF IN SUPPORT OF OUR PERRIS YOUTH! WE WOULD LIKE TO SAY THANK YOU TO ALL OF OUR FOOTBALL FAMILY FOR JOINING US AND SUPPORTING US IN THIS 2018 SEASON. WE GREATLY APPRECIATE YOU CHOOSING TO PLAY IN PERRIS WITH THE PERRIS PANTHERS. 2019 P-TOWN BOARD MEMBERS NEEDED!